They look like they are up to some mischief. What? We weren't doing anything. Nothing at all! Aw, they are so cute! Even if they are mischievous! So much mischief that they've both lost 40g or so. Graham is being a bit bratty with me. He refuses to be picked up and will chatter teefs, kick like a rabbit and pee at me. Yes, pee AT me. He lifts that undercarriage, flips it out a bit and lets fly like a sow. I've seen him do it to Simon (aiming for his face) too. How pleasant. He gets picked up regardless and he's his snuggly self once I have a hold of him. I think he's just a bit confused with his life. He's playing both boss pig and sidekick just now. He'd really like to just be the loveable sidekick but Simon won't step up. In contrast, Simon is learning that being picked up and put back isn't the worst thing in the world. Now that he knows he'll get a pellet when I pick him up, he stands and waits. His panic had been put down to his head tilt giving him a swimmy head but I think he'd just gotten into bad habits and needed a predictable routine. And some bribery. I love the snuggle ninja description too. Snickers has tried some of that in his lifetime, especially with Ouiser back when he was inclined to feel cuddly. But not like Graham. But that'll be because of the boar-harmonizing water Clairey serves. Funny, Graham is reminding me a bit of Snick in his youth. Particularly the Charlie chapter. I witnessed another step in the right direction yesterday. Simon has decided to actively submit rather than avoid the situation. The avoidance was bothering me. I saw him tuck his nose under Graham's chin a couple of times when G was rumbling him. He's also being slightly more inquisitive and even a tiny touch playful. I also have reason to suspect that, even by guinea pig standards, Simon is not really an intellectual powerhouse. I went away from guinea lynx and I come back to these handsome fellas. Absolutely stunning! Snick isn't an intellectual powerhouse either. It's okay. Plus, I think the limited intellect makes them more likely to wind up people-pigs. Ouiser had to constantly evaluate the over/under on getting eaten by house eagles. Snick just bumbles along and assumes he'll be snuggled and scritched by everyone he meets. Um, guys, you know what I just saw? Graham grooming Simon's ear. Just a little bit and while they were standing but Simon didn't flinch (for once) and even closed his eyes a little. WooHoo! ;o) Go Graham & Simon! Piper will pee all over me on car rides when she is annoyed. She holds it for 1 1/2 hours and as soon as I take her out at the halfway mark for a drink she pees all over the car. I just saw Simon zooming and popcorning. :) That's the first time (that I've witnessed) since they moved in together. It was another little worry I had. Graham popcorns for anything and everything. He's part tigger. 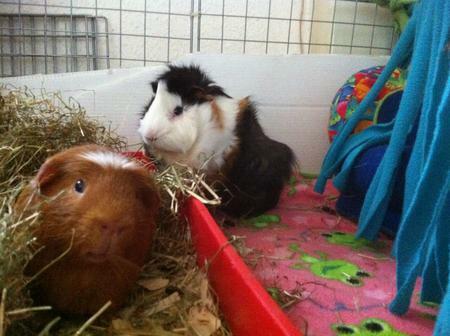 Graham watched Simon but carried on eating hay and didn't insert himself into the situation. At last. So it IS the water? It is, isn't it? Not blind luck, winning lotteries forever, etc. etc.? I don't want to call it success yet. I still feel like Simon's holding back a lot of himself. Even though he now has the job of chief wheeker.